While grilling burgers may seem like outdoor cooking’s greatest no-brainer, there are actually nuances to the grilling technique that will give you a better burger every time. Though we’re demonstrating it here with Kobe beef burgers, this same technique can be used with all of our specialty burgers. Season both sides of the burgers liberally with salt (keep in mind that a fair amount will fall off on the grill). 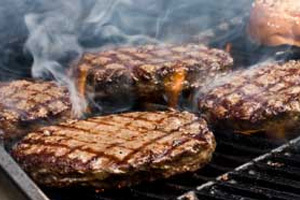 While you can finish the cooked burgers with pepper (we recommend freshly ground Tellicherry Peppercorns), pepper put on prior to grilling can burn and become excessively bitter. Place them on a well oiled, hot grill, and don’t touch them for a few minutes. When you estimate that side of the burger is half done, give it a quarter turn to achieve those diamond-shaped grill marks that everyone loves. When the side is finished, flip the burger and repeat the same process on the other side. Once you’ve flipped the burgers, place the tops and bottoms of your hamburger buns (we prefer brioche) on the grill to toast. Toasting the buns not only adds a crisp texture and toasted flavor to your burgers, but also helps keep them from becoming soggy. After flipping is also the appropriate time to add cheese if you’re cooking cheeseburgers, so that the heat of the grill can start the cheese melting before the burger hits the bun. Keep an eye on your burgers! Overcooking Kobe beef or any of our other exotic burgers will destroy the flavor and tenderness that makes them special. Until you develop an eye for exactly what your favorite level of doneness looks like from the outside, consider using a probe thermometer to check your burgers. The USDA recommends cooking ground meat to an internal temperature of 160 degrees, which is usually considered Well Done. This gives you a good base temperature to adjust as you will.